“…we want to make sure we’re singing songs that help young people understand they are in a moment of time but that the church has existed for thousands of years…we want to place an emphasis on history, returning to the sacred call to worship…” Desperation Band, one of today’s most popular and respected worship bands/movements, have recorded albums since 2001- one of the many bands that have won acclaim through their vertical worship songs. There are hits that have been covered by many CCM and worship artists, such as “I Am Free”, “Here In Your Presence”, “Strong God”, “Magnified”, and “Overcome”, though the band still remain humble and true to themselves; they remain grounded in their church, New Life in Colorado. With such emphasis on Jesus and always overtly preaching the gospel, the band now returns for their live album Banner on the back of the success of the 2012 recording Center Of It All. Standing at 12 tracks and 69 minutes; the project boasts many guest vocalists, including Nico Perez, Jonathan Moos, Gina Milne and Kari Jobe; and is a must listen for fans of Hillsong or Jesus Culture. Though I’m not sure why the album isn’t released under the banner of New Life Worship (cause that’s basically what it is…more or less), Desperation Band’s heartfelt and solid effort, underpinned and anchored by lead singer Jon Egan’s creative and relevant lyrics, and strong vocals, has indeed won me over. This album turns into more and more of a treasure every time I listen, and with a song like “Fun” closing the album, that’s exactly what Banner is- it’s fun and unashamed praise to God, and don’t you agree that we all need celebration in our lives? That’s exactly what Desperation Band dish out in this release! Jon Egan contributes 5 songs out of the 12, a rarity in previous Desperation Band albums- as he’s normally sung all of the tracks. Maybe the artist should have said Desperation Band And Friends, if that’s what the band members wanted to do. Nevertheless, Jon’s earnest vocals and encouraging lyrics make these songs very powerful and meaningful, as I bask in God’s presence and listen to the God-given lyrics. While a 69 minute album can seem to drag on a bit, in no way was I bored in Banner, especially when Jon was leading! As “Future”, co-written with Jason Ingram, starts off with a stirring electric guitar riff and hand claps plentiful, the mid tempo worship melody, which has a slight similarity musically to Hillsong’s “Running”, we are introduced to a song of praise and thankfulness, where God is praised and is described as being alive in us and the future we’re running to. Though the song is lyrically cliché, there’s no denying Jon’s passion, and the band provide a backdrop for uninhibited praise and joy as we sing out eternal truths to our Father and Saviour. I especially receive chills during the bridge where the band cry out ‘…our hope is in You, our hope is You..’– This song is brilliant as an opener! “Make A Way”, co-written with Jason Ingram again, is another gem of a track, where Jon earnestly reminds us that ‘…where this is no way, You make a way, where no one else can reach us, You find us…’. It’s a sobering and also comforting thought that Jesus will search for us and will find us every single time we try to run away from Him or find ourselves falling away; and I believe this necessary song is sure to strike a chord with many listeners who feel like they’re in the position of Jonah or the lost sheep in the Bible. A slow piano led ballad that builds to an epic and majestic like Holy Spirit led worship anthem; this is Jon at his peak vocally and songwriting-wise; it’s one fo the best songs Desperation Band have written and recorded! Jon’s offerings continue with the more subdued worship ballads “Break Open” and “Fall Into You”. The former is a mid tempo guitar led captivating moment of surrender and vulnerability, and a wonderfully written worship anthem, as Jon earnestly and eloquently outlines how we can pour out our life to God because of everything He’s done for us. Lyrically epitomizing what the album is about, Jon reminds us that our love for Jesus and subsequent worship of Him should be above any preconceived ideas we have about the methods of worship; this song is sure to free the religious spirit in some people as we all try to let go and worship God however it looks like. The latter is a more laid back piano and guitar led ballad, with simple lyrics basically proclaiming that we can fall into and run to Jesus whenever we need to, and we are safe in His arms as Jesus is faithful above any other on Earth. The final Jon Egan led song; the loud, raucous, upbeat and frenzied electric guitar ball of energy called “Fun”, is the album closer, and shows a side of the band we haven’t seen that often. It’s an uninhibited, celebratory, dance and electronic inspired song that is reminiscent of Press Play, Capital Kings or Royal Tailor, and unusual for Desperation Band to show this fun side of them, however as the album on a whole seems to be focusing more on the younger generation in terms of style, the final track on a compelling and eclectic album is fitting, as we proclaim that ‘…we’re dancing with every reason to dance now, we’re singing with every reason to sing out, Your love unfailing never fails to free us, and now we’ve only just begun, we’re having fun…’. With the remaining 7 tracks showcasing and highlighting new and upcoming singers and songwriters, I am once again impressed by New Life Worship church as I hear artists who are sure to be popular in the coming years, as they sing and worship God. The title track, led by Jonathan Moos, is a vibrant eclectic worship anthem driven by authoritative electric guitar, meant for the audience to declare and raise a stand that our God is the One we can rely on. As we shout out and declare ‘…we wave our banner, strong and mighty, He will not falter, God our banner…’, I can bravely and firmly shout along with Jonathan, agreeing in the assertions that our God reigns and is Emmanuel, and I am sure everyone else can follow suit and sing boldly as well. Jonathan Moos also lends his voice and worship leading prowess to the mid tempo guitar led Hillsong-esque worship anthem “With All My Heart”, essentially a vulnerable prayer as we proclaim that we praise God with all of our hearts; with the bridge being a stirring and Holy Spirit orchestrated moment of spontaneous and free worship to our Lord God Almighty. It’s evident that the heart of Desperation Band is to lift Jesus high- God being lifted up more and more is the theme in many of the songs. There’s a stirring slower tempo anthem led by soft keys and guitar, where the words are declared that ‘…everything, Jesus we are Yours…’ (Nico Perez’s “We Are Yours”), a piano led contemplative prayer of gratitude that asks God to multiply the effects of everything we give to Him, so that we point to Him and the lives we touch are inspired to follow Jesus (Gina Milne’s “Multiply”), and a stirring acoustic guitar prominent duet led by both Nico Perez and Gina Milne (“No One Else), led by keys, softly reminding us that Jesus is our anchor and that ‘…my God You’ve broken my fall, God You’re stronger than it all…’; however for me two songs stand out amongst the other ten in this superb and stellar track list. Kari Jobe is one of my favourite female artists of late, and her inclusion on the powerful and impacting track “On The Throne” is truly one of my favourite songs on the album. The song is unequivocally one of the most vulnerable, emotional and worshipful tracks on the album. Kari’s voice is also just as magical and pristine as her live album earlier this year. Led by hand claps and the ever reliable synth, as well as light electric guitars and Kari’s angelic voice, this declarative anthem of our resolute confidence in God’s sovereignty and faithfulness is a highlight and one of my favourite Kari Jobe tunes ever, as we unequivocally declare that ‘…every season, I will press on, for God alone is on the throne…’. Bri Giles then finishes the album with gusto and passion, singing in the style of Kim Walker Smith, as we are met with a electronic synth led prayer of longing and need, as the words are sung ‘…all I want is to know You Jesus, draw me closer to Your heart…’. “…We’re not interested in being part of the worldwide movement that is modern worship—the albums, the sales, the touring, the photo shoots—because if it starts to pay back more than what it costs you, that’s when it gets dangerous. Worship is supposed to be carried on our backs; it’s supposed to be sweaty, to take some effort. That’s why it’s called a sacrifice of praise. That’s our life message…”– When you take this quote by Jon at face value, we are introduced to a band not fussed or concerned with popularity and respect, but rather winning souls for the Kingdom. When you think about that from the angle presented, you discover that at their ultimate peak, the band’s worship leading ability is sure to win every soul in the audience and listening, for Christ. With a heart for Jesus like Jon Egan’s, I’d imagine Desperation Band to record many more albums to come. With worship ballads and pop radio tunes alike, Banner is a smorgasbord of a worship leader’s dream of diversity, with any of the 12 songs being able to be played within the church. With such emotion evoked from Jon, and relevant messages and themes being imparted to the listener, Banner is just that- an album of singing about how God is our banner. A Dove award/s surely, for these guys?! One of the most musically and lyrically diverse live worship albums of this year so far; you would not go wrong with buying this album next week! I have certainly been touched by this band, and you will be too! 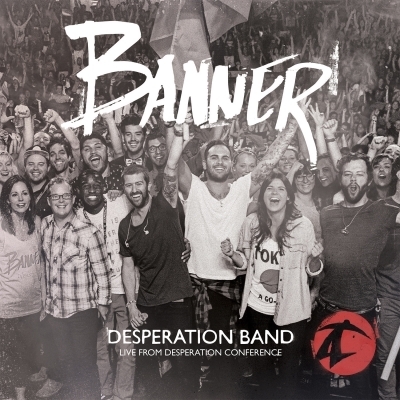 Truly and in all honesty, I’ve never heard about Desperation Band before last week. Perhaps, my eyes and ears decided not to pay attention to the band. I love these guys and what they stand for. My favorites are Closer To Your Heart, Fall Into You, Multiply and Make A Way. Thanks for the review Josh. Thanks Mercy for the comment! Glad you like the review! You should definitely check out Desperation Band’s previous albums! The 2012 album Center Of It All is pretty good, and I absolutely love their songs “I Am Free”, “Overcome” and “Here In Your Presence”! I will check it out Josh. Thanks for the recommendation.